I didn't pick PPQ being cut... but then I don't think it was on Air NZ's radar either. Given the political fall out I can't see more changes ahead. I picked Air Chats as a rising star and in particular looking for Saab work. So we wait to see what happens on Paraparaumu and Norfolk Island... both looking likely to be airborne by year end. The silence indicates no decision was made to purchase Beech 1900s. The second Caravan did arrive. Earlier this week an announcement for Barrier Air was promised on their Facebook site but nothing online yet. Now called Air Auckland. I'm not sure if they are still operating Ardmore-Waiheke-Great Barrier. They did get airborne again. Scheduled services are minimal. They operate regular air ambulance and medical staff/patient flights between Gisborne and Hamilton. A pity it's not possible to book on the staff/patient flights. Their Chieftain has been written off - the Caravan hasn't flown this year - their flights were being operated by Originair. Seems to be flights only on Fridays and Sundays now. 84 per cent of business travellers would prefer a new air service to depart earlier from Paraparaumu to Auckland, according to data released from a Colmar Brunton Poll commissioned by the Kāpiti Coast District Council. In a survey conducted during May 2018, 36 per cent of business travellers said they would prefer a 6.45am departure, and 48 per cent a 7.30am departure. Heather Hutchings, Kāpiti Coast Chamber of Commerce Chair, says these results back up anecdotal evidence that an earlier, more frequent service to Auckland would attract more business travellers. 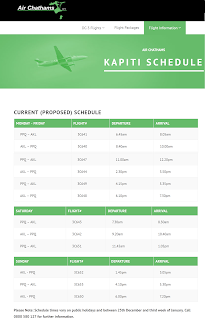 “Local businesses have been telling us for some time that they would choose to fly from Paraparaumu if more early morning options were on offer. A 6.45am flight would enable them to be in Auckland’s CBD for the start of the business day. 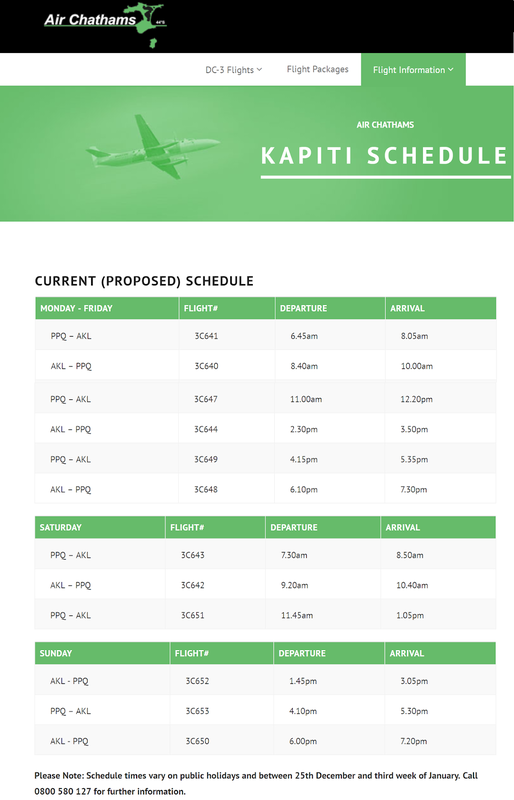 A better flight schedule from Kapiti has been identified as one of the reasons more people would choose to fly from Paraparaumu over Palmerston North or Wellington. Affordable fares and easy, cheaper parking are also important considerations for travellers to make and align with what we’ve heard from business in both Kapiti and Porirua. It’s important that a new flight service takes these factors into consideration, particularly if we’re to make the most of the untapped market to the south of Kapiti,” says Heather Hutchings. The Colmar Brunton Survey found that Porirua residents travelled more than 85,000 sectors to and from Auckland from Wellington, compared to only 1,672 sectors from Kapiti. “This quantifies what we know - there's a significant market in Porirua and Mana, but there is some work to be done on convincing them to head north instead of south when choosing to fly to Auckland. There is a perception it’s further to travel, but we need to be looking to the future. Travel time will significantly reduce when Transmission Gully Opens in 2020. “The Chamber supports the Kāpiti Coast District Council in their efforts to secure Air Chathams for Kāpiti Airport. These survey results have given us a much clearer picture of what travellers and business commuters are looking for in flights to Auckland and will help us get a new service off the ground quickly should it get the green light,” says Heather Hutchings. The Kāpiti Coast Chamber of Commerce exists to advance the economy by creating wealth and employment and solve local business issues by providing a collective voice for business in Kāpiti. Over 300 members in Kāpiti belong to the Kāpiti Coast Chamber of Commerce to stay connected, network and gain knowledge and support from our local membership. Following customer requests and commencing from 11th July 2018, Originair will offer Nelson travellers a return service each Wednesday allowing a full business day in Palmerston North. This service will depart Nelson at 8:20am and arrive in Palmerston North at 9:10am, returning from Palmerston North at 5:00pm and arriving back in Nelson at 5:50pm. We hope business and leisure travellers will find this service beneficial. This service may be extended to other week days. Air Chathams plans to introduce its bigger 30-plus seat Saab Aircraft on the Whakatane-Auckland route remain up in the air with the Ministry of Transport delaying work at the airport. A Supreme Court ruling over Wellington Airport requires the Runway End Safety Areas at Whakatane Airport to be extended before it can be used by larger aircraft. The Whakatane District Council’s has called and accepted a tender for the work, but needs approval from its joint venture partner the Ministry of Transport. The Ministry hasn't given approval, nor has it paid its half-share of other airport works including a major runway lighting grade or past operating losses. The council’s been advised nothing’s going to happen this financial year but to keep pressing the Ministry for approval. Air Chathams meantime has been forced to use two aircraft on the Whakatane service to meet demand, and farmers who graze stock within the airport grounds don’t know what their future holds. Air New Zealand has introduced new Wellington business day flights to the delight of Queenstown businesses, but placed restrictions on the Christchurch route. The changes included two new return daily flights from Queenstown to Wellington on jets. However, the first flight of the day from Queenstown to Christchurch was changed from a jet to a smaller turboprop ATR. The turboprops are more likely to be cancelled in adverse weather conditions as they are not equipped with Required Navigation Performance (RNP) technology. Two years ago the company announced it would install RNP on its ATR fleet by 2018, but regional affairs manager Ian Collier said there had been "technical and regulatory" hold ups. "We will certainly be ready next winter. That should help with problems on the first flight to Christchurch in winter." It was a challenge for the company to get the right mix of aircraft on every route, Collier said. "The reality is the aircraft mix we've got is not going to give us the perfect answer this winter and it will be weather dependent ... For every move we make we get a corresponding groan from somewhere." The company announced the changes at a Queenstown Chamber of Commerce get-together on Wednesday night. Queenstown Chamber of Commerce chief executive Anne Lockhart said the organisation had lobbied for four years for a Wellington schedule that allowed people to fly to and from the capital at either end of the business day. The loss of a jet to Christchurch in winter was "a step back ... but I totally understand." She urged Air NZ to continue putting a "foot on the accelerator", but also to keep working to meet the infrastructure needs of communities who were struggling to cope with growth in visitor numbers. "Not all growth is good. Someone has to pay for it ... Our message to central Government continues to be [that we need] a contribution from that very large visitor market." Collier said the company was "heavily engaged" in that ongoing conversation. "The quicker we can move on it the better to ensure there's a fair system in place to address the issues we all have." Air NZ general manager of networks Kate O'Brien said there would be increased capacity on trans-Tasman routes into Queenstown following the end of the Air NZ-Virigin Australia alliance in late October. Air NZ would re-enter the Brisbane to Queenstown route with flights three or four times a week and retain its Melbourne route. Virgin Australia would enter the Melbourne to Queenstown market and retain Brisbane. "So there will be 28 per cent capacity growth into Melbourne and nearly 60 per cent into Brisbane coming this year," she said. Collier said the company was looking at options for flying a Wanaka to Auckland route. "We would like to do it but the priority is consultation with the community and that's something being led by the airport at the moment." Air NZ was looking ahead at long term forecasts based on Ministry of Business, Innovation and Employment figures that put visitor arrivals at 4.5 million a year by 2022, he said. "We are currently ahead of that [growth rate]. We are doing everything we can to make sure we are match fit and more than ready for that. We're not taking our foot off the accelerator. We're here to grow." Air New Zealand will operate an additional 12 one-way business timed services per week between Palmerston North and Auckland from mid-August. The new service will depart Auckland for Palmerston North at 5:50pm Sunday-Friday, with a return service from Palmerston North to Auckland departing at 7:25am Monday-Saturday. Air New Zealand Regional Affairs Manager Ian Collier says the airline continues to see strong traveller demand between Palmerston North and Auckland. "It's fantastic to be able to meet this demand, with the additional services now offering travellers from Palmerston North the option of three services to Auckland before 9am, and those returning from Auckland three flight options between 5pm and 7pm." Palmerston North City Mayor Grant Smith says, "It's great additional business capacity has been added to an already busy Palmerston North-Auckland route. Adding these extra services brings much opportunity and needed capacity for business, educational and leisure visitors' travel." Palmerston North Airport Limited Chief Executive David Lanham says, "To accommodate unprecedented demand from our regional travellers, the airport company has invested significantly in facility upgrades and so we welcome the news of Air New Zealand's investment in additional capacity on the Palmerston North-Auckland route." The new schedule will take effect from 13 August 2018.